Effect of climate policies on CO2 emissions: imperceptible | Watts Up With That? When discussing climate change, one often hears this or that bad thing will happen ‘if we do nothing’. Implicit in this assertion is the notion that if we do something, well, then CO2 emissions will decrease, or at least they won’t increase as much as they would have. It seems a duh statement: doing something about CO2 emissions causes them to be lower than they would have been if you we had done nothing. 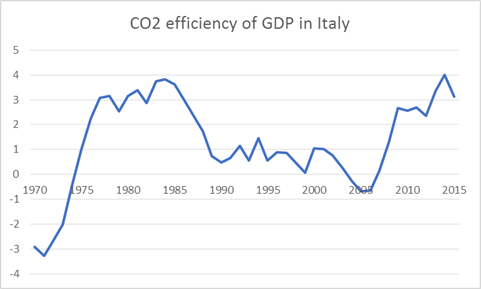 But the evidence is lacking: in this article I show how multiple countries, over a span of several decades, fail to show signs of a policy-induced change in emissions. And the few cases in which policy seemed to be driving emissions were not related to climate policy. This is just a tautology, of course: if you emit one ton of CO2 and generate GDP of $2,000, then you carbon intensity is 0.5 tons of CO2 per thousand dollars. (This is approximately the current global figure). A more intuitive way to look at it is by inverting numbers: instead of calculating how many tons of CO2 we emit per dollar, we’ll see how many dollars we generate per ton of CO2. Let’s call that carbon efficiency: in the above example, it would be $2,000/ton. 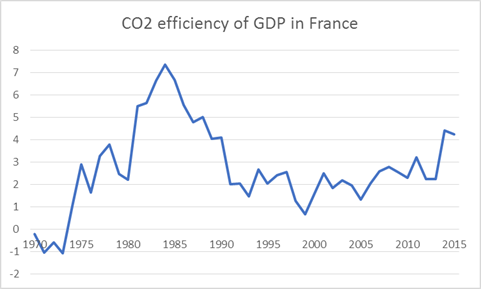 My point is that, in theory, climate policies aren’t supposed to affect GDP, and in particular aren’t supposed to make emissions smaller by making GDP smaller. Sure, some activists are open about their disdain for economic growth, but no mainstream figures in the climate movement and bureaucracy have endorsed that position (publicly). 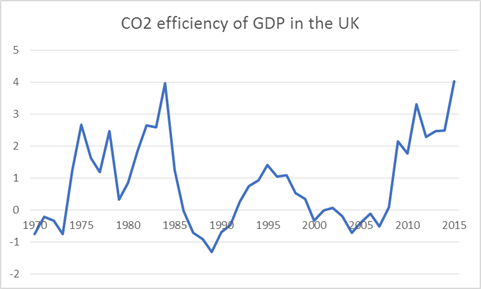 And while climate policies do have a cost and may well make GDP growth slower (than it would otherwise have been – it’s so hard to write like an economist), really, how big can that impact be? 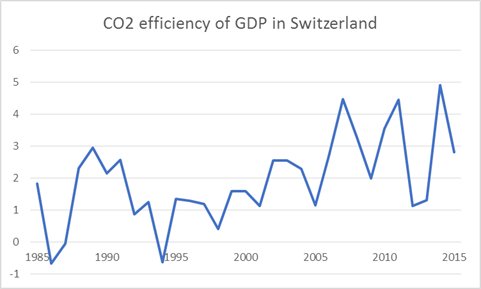 If climate policies made yearly GDP growth 0.2% lower, for instance, the effect on emissions would be negligible (though the economic costs, in the long run, would be tremendous). 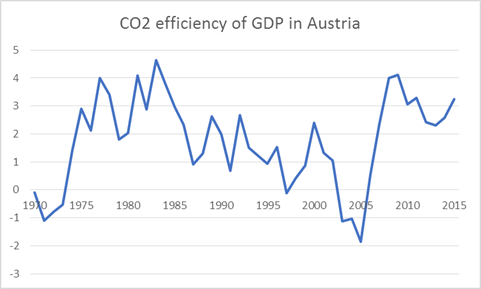 So the only way climate policies can have an effect is by increasing carbon efficiency, or reducing carbon intensity (in this article I will use the former phrase). Again, this is an obvious statement. But it’s stunning that the vast majority of climate ‘pledges’ and ‘targets’ do not mention CO2 efficiency, but absolute emissions instead. For instance, California’s target for 2030 is for emissions to be 40% lower than they were in 1990 – regardless what GDP does in the meantime. 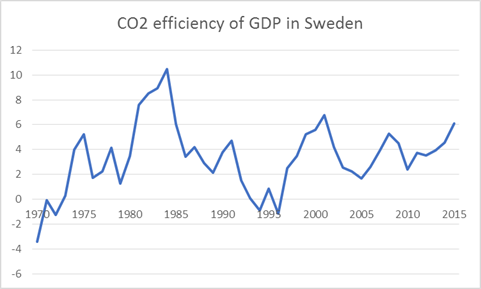 So in the case of a country whose GDP grows by 1%, while at the same time emissions fall by 1%, we have an increase in efficiency of 2%. Mathematically-obsessed readers may point out you cannot simply ‘add up’ the changes – you have to divide 1.01 by 0.99, which gives an improvement of 2.02%. No worries, that’s the way I did the numbers. So in one of the world’s best-observed regions estimates vary by a factor of four. Given this context, talk of ‘emission cuts’ is just comedy. Countries will put forward whatever numbers suit them, and nobody will be able to verify the slightest thing about them. While we cannot verify how much CO2 is taken up by forests in Ecuador, there are many ways to verify country’s fossil fuel consumption – and the resultant emissions. Since these make up the bulk of CO2 emissions, a gas which in turn makes up about 80% of the increase in greenhouse effect over the last few years (see table 2), we’re in fact addressing most of the ‘problem’. First, I downloaded emissions data from the BP statistical review. Their methodology is described here. Basically they take fossil fuel consumption, subtract the part that they estimate is not burned (because it’s used as feedstock instead of fuel), and multiply (depending on the carbon content of each fuel). Ethanol and other biofuels are excluded. They do this with the oil, coal and gas burned in each country. This means that, for instance, if Austria uses electricity imported from coal-burning plants in Poland, these emissions will be counted as Poland’s, not Austria’s. The same happens if a factory closes down in the US and reopens in China. But there is really no other way, as accounting for ‘upstream’ emissions is essentially impossible: who is generating that electricity, who is making the batteries that go into electric cars, who mines the minerals that go into the batteries, etc. So using emissions at the tailpipe (or the smokestack) seems the only workable solution, even if no method is perfect. To avoid issues with countries that spent decades under a Communist system, or that have changed borders, I pick fifteen (mostly) rich nations in Western Europe; these are the countries traditionally seen as ‘climate leaders’. I compare them with the US, where allegedly climate policies have been much weaker. I exclude Germany as I wasn’t sure how to deal with the reunification. In the future it would be useful to account for it, as well as other developed countries (Canada, Australia, etc). That leaves us with fifteen countries, almost all having several decades’ worth of emissions data. To compare them with GDP I get the growth rates from the World Bank. I put it all together in this file. Imagine if, to remark the strength of the US economy in the last decade, I show this chart. In that article, the author comments that one cannot see if British Columbia’s carbon tax had any effect. The truth is, whatever the merits or demerits of this tax, you wouldn’t see the effect even if it was massive. Visually, if you plot the reduction in tons of CO2 emitted per dollar of GDP, you cannot ever reach zero, because emissions will never reach zero; you can only approach it at an ever-slower pace. (To his credit, the author then cites the percentage change and compares it with the US. And yes, it’s truncated at 250 rather than 0, but the point remains). Going the other way, if one plotted dollars generated per ton, on the other hand, the line would surge – even if there was a slowdown in the rate of decarbonization. Neither of these is a good way to visualize the data. Summing up, when dealing with compound growth you should not show the absolute values, but the percentage change; with an absolute-value chart it’s impossible to tell what the rate is doing. I’ve never seen CO2 efficiency plotted on a percentage chart so there we go. In all charts I smooth the data by showing a 5-year trailing mean; since the first year with CO2 data is 1965, and the first change in CO2 emissions therefore is reported in 1966, the mean starts in 1970. Remember it’s all in this Excel so you can take a look. First off, America, land of the free and ‘climate deniers’ too. 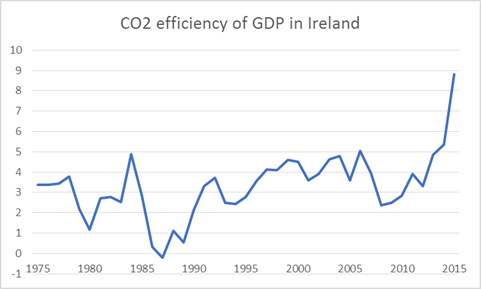 Never mind the Koch brothers, the country has had exactly seven years (out of fifty) in which carbon efficiency declined; as you can see the mean has been positive except for the very first year it’s reported, and it’s nearly always been above 1.5%. (Furthermore, three of those seven years happened very early in the period, before the 1973 oil shock). In other words: if the US economy had grown since 1966 at a rate of about 2% a year, CO2 emissions wouldn’t have increased over the period at all. That’s the key message in these charts, I believe. Rising carbon efficiency isn’t a fluke or a paradox or an anomaly: it’s the norm. It’s what happens most of the time in a modern economy, by which I mean a post-1973 economy (though there is some evidence carbon efficiency was already rising before) When the price of energy shoots up, people have an incentive to be more frugal in how they burn oil and gas, and so the decarbonization rate. But this progress is not reversed when the price of oil and gas declines; it simply slows down. Of course, if an economy is growing below the rate of decarbonization, this means emissions will fall even as GDP expands; no wonder the list of countries in such a situation is basically a list of countries with low economic growth. 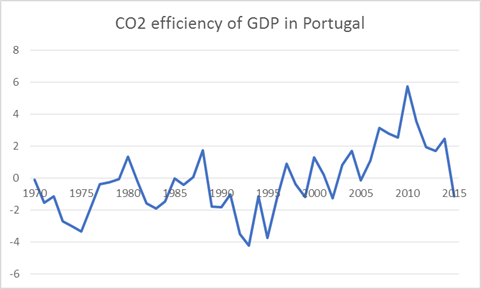 Only those with a very tenuous grasp of math would claim such a phenomenon is evidence of ‘decoupling’ or ‘cutting the link’ between emissions and GDP growth. Following their logic, global GDP growth of 0.1%, while emissions likewise fall 0.1%, would be evidence that we have ‘decoupled’ these things. So you can see why reporting the rate of decarbonization is so important: whether an economy decarbonizes is a pointless question. Of course it does, most of the time. It’s natural and it doesn’t require any special measure or any COP meeting. The real question is how fast does it decarbonize. The rate over the Obama years has been 2.67%, something of an improvement over the 2% seen in 1966-2008. Of course 2009-2015 was also a period of very high oil prices, combined with low gas prices which displaced coal generation. The average over 1966-2008 is 2%, but this rises to 2.43% if one excludes 1966-72. Put other way: compared to the average since 1973, the rate of decarbonization accelerated by 0.24% during the ‘shale revolution’ years. Let’s cross the pond now. As the old adage goes, Americans have heated swimming pools while Europeans have shoebox apartments. 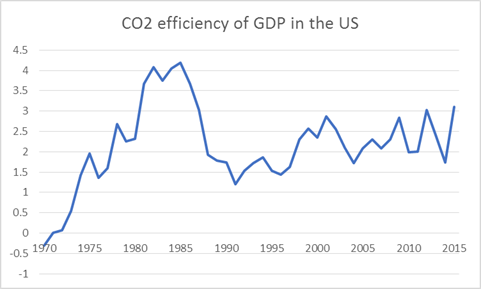 It’s a bit of an exaggeration, but my point is that differences in the carbon efficiency of the US and European economies didn’t arise as a result of climate policy. Rather, economic and social differences have existed for a very long time; Europeans didn’t start living in apartments as a result of climate policies. To make this point, I will report the average decarbonization rate for all European countries involved since 2000. 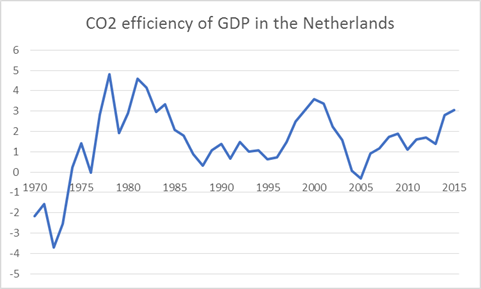 Kyoto was signed in 1997, the Emissions Trading System started in 2005, Energiewende started in 2000… one can quibble about the start date, but it’s really hard to see how European countries are improving the decarbonization rate over time, or how they are besting the US in this regard. For Austria, the 2000-2015 average is 1.61% (2.3% in the US over the same period). no obvious trend other than the increase in the rate starting 2006 or so. In general, small economies will be more volatile and less reliable – a single power plant, or refinery, or reclassification of some kind of fuel can skew the emission numbers. 2.89% in Belgium, also for 2000-2015. You can see the peaks due to the two oil crises of 1973 and 1979, displaced to the right a bit by the trailing 5-year mean. Little improvement in efficiency when oil was very cheap, but lots of improvement since 2008. A couple years above 10%, but again, small countries are volatile. 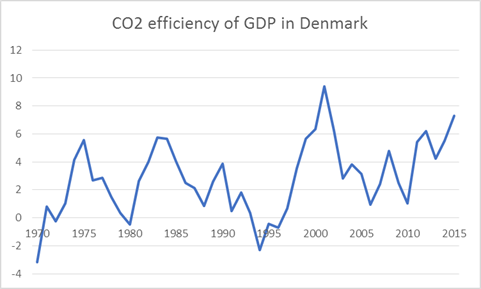 4.27% in Denmark, perhaps one of the few cases of decarbonization success. (The country has less than six million people and can use the much larger German grid as a ‘battery’ by exporting surplus wind power). 2.75% in France. The bulge in the early 1980s due to the country’s push into nuclear is very obvious. That mega-spike is due to Ireland’s phenomenal 26% GDP growth last year. Excluding the mysterious figure, the average over 2000-2014 is 4.21%. 1.74% in Italy. As in several other countries, in 2015 with the plunge in oil prices efficiency slowed down greatly. 1.41% in the Low Countries. 1.97% in Norway. The country is part of the European Union’s Emissions Trading System, and has quite the reputation as a ‘climate leader’. But it’s a big oil exporter, and so more or less shielded from oil shocks; unlike in most other nations, efficiency didn’t spike in 2009-2014 (if anything the rate declined). 3.81% in Sweden. Not only is the rate quite high; it’s also increased further in 2015. 1.50% in the UK. While the rate itself is pretty bad, since 2009 or so it’s shot up. And it was still over 4% in 2015. The swings in the price of oil, which usually correlate with natural gas, seem to determine the pace of decarbonization far more than any policy. That said, the decarbonization rates for Denmark and Sweden are certainly higher than in the US, and seem to be increasing over time; unlike other nations their efficiency hasn’t slumped along with the price of oil in 2015. The same is true of the UK for the last 6 years or so. Perhaps they’re doing something right, or perhaps there is something else that escapes me. December 27, 2016 in Climate News. ← Newly launched Chinese satellite claims to monitor CO2 – but does it? 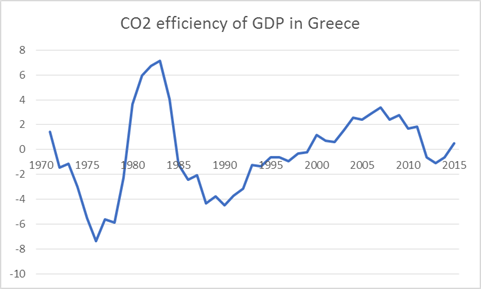 On a more personal level, does the CO2/GDP relationship work with personal wealth too? I’m going to go make a big bonfire and see if I make more money this week to test it out. Burn coal for maximum financial returns. When push comes to shove, we simply don’t have the ability to regulate climate. In fact, after billions upon billions spent, it seems to me that we can barely demonstrate an effect. So we must invoke the precautionary rule, just in case. Yes, let’s destroy the economy. Just in case it’s “too good”. A totally pointless article, since CO2 is good for all life on Earth. Much more is much better. Let’s see someone do a serious study of the social benefit of “carbon”, then we can discuss. Agree gnome, more CO2 is good for all life on earth. As an aside, CO2 is not carbon it is CO2 a compound not an element. H2O is water it is not hydrogen or oxygen. Equating increases/ decreases in CO2 with increases or decreases of carbon does not make sense. Consider some elementary examples for the author. Carbon burns to produce CO2, CO. etc. But CO2 makes a most efficient fire extinguisher. And CO may kill you. Hydrogen if very explosive as it combines with Oxygen, but H2O like CO2 are essential to life on earth. Enough trivial examples. Elements are not compounds, compounds are made of elements and other compounds. Your point may be true, but this excellent article makes many other significant points as well. Never throw the baby out with the bathwater. Yes, the underlying premise that CO2 emissions cause harm is faulty. 1. The historical proxies on geological time scales show conclusively that atmospheric CO2 concentrations never correlate with average global temperature. The ice age time scale proxies show that CO2 follows temperature because of changes in land biology responding to surface temperature. 2. CO2 does not accumulate in the atmosphere. See the biogeochemical carbon cycle. The atmospheric concentration is a vestigial part of global biology turnover, interleaved with large oceanic and very large geological pools on different time scales. The same can be said of nitrogen, oxygen and methane. All have natural biological turnover. Water vapor has a unique biogeochemical cycle. Only inert argon accumulates over geological time scales. 3. Any biologist who understands photosynthesis knows that the current atmospheric CO2 concentration is dangerously low. Plants have been evolving for millions of years to improve their ability to remove CO2 from the atmosphere. Adding more CO2 to the atmosphere is entirely beneficial to global biology. So the adoption of low CO2 emitting technologies is determined more by the impact of the oil price than anything else? I’m convinced that has been the case. Because you have demonstrated it. But it could be argued that if the oil price has an effect then other things could also have an effect. This article could be used as evidence of a need for far more expensive anti-fossil-fuel policies that would have an even bigger impact than the oil price. It could be argued that we just haven’t been zealous enough yet. Efficiency is only one part of the equation. Overall price matters. The company I worked adopted (1971) an energy conservation technology program, 1 mm BTU was valued at 1.25$ and a few years later at 1.9$. At that time it was possible to carry out energy debottlenecking programs because energy performance of processes were lousy, After 1985 only grass-root designs with an improved energy consumption were possible because of relative low incremental capital cost. What does “1mm BTU” mean? Silly rabbit. The raison d’etre of climate policies is virtue signaling. It has nothing to do with actual lowering of CO2 emissions. You want to make it LOOK like you are “helping to save the planet”. Just decades ago most scientists considered CO2 to be an incidental trace gas that would have near zero effect on climate. “Just decades ago most scientists considered CO2 to be an incidental trace gas that would have near zero effect on climate”. Now, lets see – CO2 is an “insignificant trace gas” but simultaneously is the one gas than just happens to make the planet green. Heck that’s some petty damn powerful *insignificance* – even when not factoring in it’s LWIR absorptive powers! The KEY word here is incidental. Incidental does not necessarily mean insignificant. “…fail to show signs of a policy-induced change in emissions. THAT is the duh statement. Policies are the summarization of talk that make for great headlines that keep the shallow (or non-) thinking farm animals/worshippers fearful and dolling out money, most often in the form of taxes. “Policies” are not for effect, they are for CONTROL. Let me re-phrase that: The “effect” sought via most climate policies to-date is not lower emissions and thereby reduction of “climate change” (if you think it is, I have a bridge I want to sell you) but rather the control of certain groups of people and specific segments of the economy. But then isn’t “control” what government is all about? It’s when that control is applied unfairly or when the government elites “think” they can control something (like climate) the catastrophe happens. That being the main point of the post… IMO. Read your link. Its title is ” How much CO2 is taken up by the European terrestrial biosphere?”. It isn’t about emissions of CO2, or CH4, or anything. It is about the amount of C held in the biosphere in a region. And yes, it isn’t well measured. The Paris agreement includes CO2 uptake by forests as negative ‘land use’ emissions, or at least many countries do so when reporting their totals. I checked the issue last year and in fact fossil fuel emissions were higher than the total, meaning the ‘contribution’ from land use is negative (meaning uptake is supposedly greater than emissions from tree cutting and so on). So while the link doesn’t specifically discuss land use CO2 emissions, the uptake is used to ‘calculate’ the ‘net’ of these emissions. All quite meaningless, as both actual land use emissions and uptake are anyone’s guess. And Nick once again shows his inability to read in context. A billion birds per year are killed by cats. For all wind turbines the total in the US is less than 1M. That’s a factor of 1000 difference. how many birds of prey are killed by cats? I favour throwing cats at windmills! It’s like killing two birds with one stone. Shoot, I meant John Harmsworth +1, You’re ok too Eric. I made a related comment on a news site regarding China taxing pollutants but not CO2. I pointed out that as the US has been able to increase its use of technology and increase efficiency, US CO2 output has dropped. China will see a drop in CO2 output when it reaches the level of technology and efficiency that allows that to happen. China is replacing its power generating stations with more efficient technologies. That will reduce the carbon intensity without yet doing something more efficient with the electricity. Increasing the efficiency of production adds to the benefit. 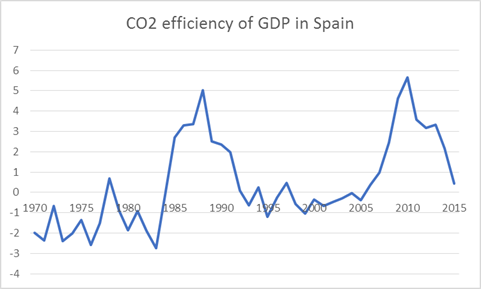 The carbon intensity will only increase if the application of the energy to creating goods and services falls in efficiency, which is not the case. If the target is ‘saving money’ people will do what they can. What I observe is governments and organisations paying lip service to the CO2 saving concept while implementing things that directly harm their economies as a sop to the agitators, or are doing nothing at all and not even fibbing about it. The US’s war on coal by means of regulations and propaganda isn’t reducing the CO2-intensity, cheap natural gas is. If natural gas was expensive, the coal powered stations would simply use expensive technologies and carry on at a higher price of output. Ontario is starting a cap-and-trade system on 1 January. Cap-and-trade doesn’t reduce emissions. It is just a home heating and transportation tax. For every $1 bn raise in additional taxes $6.30 bn in lost economic activity is ‘realised’ because the Marginal Cost of Public Funds is $6.30/new tax dollar. See Ross McKitrick’s new paper on the MCPF. Unless that revenue is spent on something that generates $6.30 in activity per $1 taxed, there is a net loss to the economy. Provincial government spending doesn’t produce $6.30 per $1 spent. Spending it on imported wind turbines and solar panels disappears the money faster. The problem with CO2 cap-and-trade is that the goal is so unworthy. 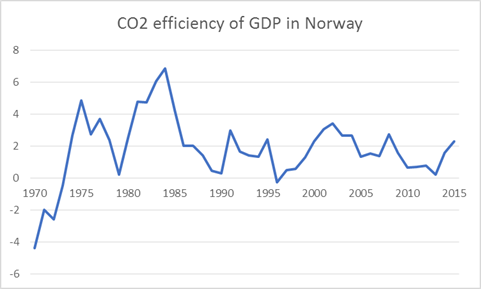 As the author above has shown, if the carbon intensity was falling anyway, and the economy grows at a slightly lower rate, there is a ‘net gain’. A cap-and-trade system offers nothing that wasn’t going to happen anyway, thus the ‘climate policy’ caused nothing except the imposition of the overhead costs of managing the tax system – churning, in other words. If the economy grows faster than the decarbonisation rate, cap-and-trade doesn’t do anything – it just raises the cost of energy to the point that the economy suffers and contracts to fit into the energy available. Think ‘energy poverty’. Using the new taxes to subsidise ‘renewables’ is an enticement to keep them unviably expensive. Why improve the cost efficiency of a wind turbine if it is selling well at the current price? No incentive there. What is the carbon intensity of a wind turbine anyway? Mined and made with Chinese coal? I think so. China will not see a drop in CO2 output when it’s output rises. It will very likely see a drop in CO2 output RELATIVE TO it’s GDP output. So an average +2% decarbonation per GDP % growth and world GDP growth is essentially been near flat-lined and most of the ‘advance’ can be chalked up to pre climate craziness factors. That dizzy Global heads of state were allowed to play this make believe fantasy for so long without a bloody revolution will be a historian’s playground for decades (if scholarly studies survive the post normality virus). But I can hear the end drumming near: TRUMP TRUMP TRUMP……. What gets me is a few weeks ago TRUMP said he wasn’t sure whether he’d keep us in the Paris Accord. Sure, most attribute that to the babbling double talk that Trump can be known for, but I’m not so sure as a few days after Trump said that he nominated the Paris Accord pushing alarmist Rex Tillerson for Sec of State. It was a huge oil company with masses of money to squander (its annual revenue is around $270 billion) on environmental pay outs; and, under its CEO Rex Tillerson, it had a track record of corporate cowardice (withdrawing funding from right-wing think tanks; failing to speak up for fossil fuels; kow-towing to greens) which meant that it was considered highly likely not to contest any court action but instead to settle. 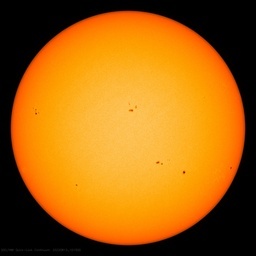 I want to believe you because your point would certainly sink the AGW ship. But, without getting into the depths of your statistical analysis, a few points. The increasing level of CO2 emissions from 1959 to present seem to correspond to a generally rising level of atmospheric CO2. Sure, we emit more than the increase increment, but we assume that extra amount is re-absorbed. Also, previous measures by proxy show CO2 to have been like 280 in the 19th century, and essentially the same for millennia before that, and I assume that includes during the Medieval Warm Period where, if we accept your thesis, you’d think CO2 would have risen to 400 or 500ppm. Further, it seems to be generally accepted that CO2 inched up in the early part of the 20th century, from ~ 280ppm to 315 in 1959, with the low rate of CO2 gain consistent with the low rate of emissions. 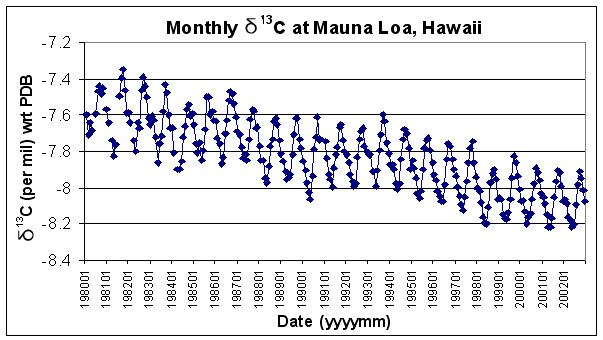 All of of sudden though the rate of CO2 rising increases dramatically circa when they started measuring it in 1959. What set CO2 off then? Why did CO2 start going through the roof just when human emissions started sharply rising? Again, I would like you to be right. But do you have any explanations for the points I raise, or links that explain it? No – and “Isotopic analysis” debunks them…..
How do we know that humans are responsible? Could you provide a link for your statement about the observed increase in CO2 in the oceans? Climate policies are the placebo of the Left, paid by taxpayers who are stupid enough to elect them. So the glaring problem with your “metric” is that you can show decarbonisation without having any real decarbonization in the economy. Here are two real world possibilities that would not work with your metric. The first is around allocating emissions based on point sources without making corresponding adjustments for imports and exports. Take steel production as an example. Over time the US has shifted from steel production being from close to 100% domestic sources to ~30% foreign sourced, even though total domestic steel consumption has not fallen by a significant amount. The jobs lost due to the relocated production are reallocated to other industries over time, most of which will have a lower carbon usage rate than steel production. 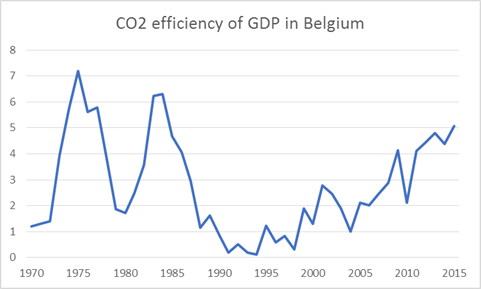 As a result, depending on how much GDP is generated from the replacement industry you could have decarbonization under your formula even though the overall carbonization associated with your economy has increased due to exported CO2 point emissions. The second is the complete ignoring of labor efficiency. As the labor force has become more productive over time, especially in the manufacturing sectors, you have people being dislocated primarily to service sector type jobs. As a result, you can have an increase in GDP with out any change in carbon usage. 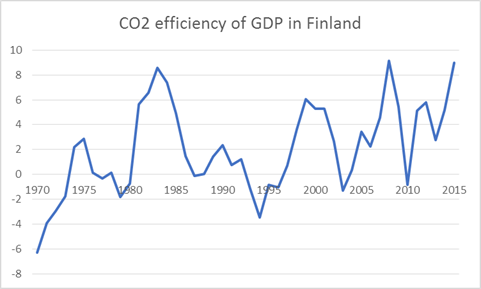 As a result, you would show decarbonization even though this had nothing to do with an economy becoming more carbon efficient, but rather a more efficient labor force. Invoking the precautionary rule, just in case, without a cost-benefit analysis is nonsense. Like the politicians who want to pass a law, saying, “If it would save just one life…” thoughtless of the price. I think you should read it again, Luke. They are all very small countries. It is very likely that the are “exporting” their emissions. Ie, they are importing power from larger countries like Germany. The emissions are reported in the country they are generated, not the country the power is consumed in. Thank you for a very interesting article Alberto. You are right in highlighting “carbon efficiency” as an essential measure in the climate debate, and your analysis is convincing. A true gem of an article. Firstly, the starting point is crucial. If you start with a situation of very low carbon efficiency, you will easily get a large increase by picking the low hanging fruits. This is very relevant when you compare the US and Europe since the carbon efficiency is about 50% higher in Europe. Secondly, the investments in renewables need at least a year or two to pay off in the carbon budget. This have considerable effect in countries with a high investment rate in renewables. Thanks a lot. I believe using the % instead of absolute values makes cross-country comparisons valid. As a frequently named Polluter and Destroyer of the Planet, Australia’s guesstimated / calculated but never ever actually measured in any sense whatsoever CO2 emmissions in the calendar year of 2016 is given as 527 Mt of CO2. At a peak of approximately 40,000 ppm of CO2 each adult human breath, each adult human being breathes out approximately 350 kilograms of CO2 each year. China’s population is currently given as about 1.355 billions. At 350 kg’s of CO2 annually breathed out by a human being, China’s 1.35 billions will breathe out each year approximately 450 million tonnes of CO2. So the 1.355 billion population of China alone breathes out each year a tonnage of CO2 that is equivalent to about 85% of an advanced Australian nation’s total annual tonnage of CO2 emmissions from all sources. A total Chinese tonnage of CO2 generated by each Chinese citizen that probably out weighs the entire total tonnage from all sources of nationally emitted CO2 in three quarters of the world’s nations. Or so the figures stack up if you are silly enough to believe the wild assed stab in the dark guesstimations / pseudo calculations of the CO2 experts. Nice try Rom, but human and animal breath come from food, and food is carbon neutral. All food comes from plants, which capture the same carbon from the air. Jan, nice comment, but…. Food comes from petroleum in the form of energy for mechanised farming and fertilisers. Essentially, we eat oil. The carbon balance of the food is not only from the air. There is a considerable portion of the carbon in food that comes from fossil fuels applied in the field. Urea is a hydrocarbon, sort of. I have not calculated the percentage – feel free. You might be the right person to do that as you are thinking clearly. Forests are essentially carbon neutral but human foods like bananas and maize and wheat and milk are not, and it goes out as 98.4% CO2 and 1.6% CO. Dealing strictly with the carbon content of food, cutting off fossil fuels would create a massive food shortage. If we switched wholesale to permaculture and biodynamic gardening, we can overcome the shortfall, but we didn’t. Thank you Crispin, but we have to separate between the carbon emissions in the production of food and the carbon content in the food itself. Mixing these are only confusing. The carbon in the food itself is carbon neutral because it comes from growing plants. The emissions in the production of food are of course not carbon neutral, but the carbon efficiency can be increased in this process as in any other production process. There is no upper limit for carbon efficiency. Jan you didn’t get the point I was making. The carbon in the fossil sourced fertiliser is inside the food. That is not only from the air. There is a whole carbon cycle in the ground too. I agree with you about the production energy. I was talking about the fossil carbon in the eaten food. Oh, yes, I see what you are saying now Crispin. However, I have now googled what you are claiming, and as far as I can see, the plants are not able to take up dissolved carbon from urea. Nitrogen is the nutrient in urea, not carbon. The carbon in urea is released in a chemical process in the ground as urea converts to ammonium and CO2. The plants are able to take up the ammonium, but according to the analysis below, the CO2 is released. The article is pointless, ill informed and also illiterate. You comment is non-specific, ill-constrained and one third of it is a synocdoche. Articles cannot have the attribute of ‘illiteracy’. Many politicians including Obama and our own Crispie Clark here in BC feel if they hurt the economy with carbon regulations it gives them a special place in Green Heaven…………weird, very weird. Small correction. 1.01 / 0.99 = 1.02 not 2.02. I’m sure others have pointed this out but not in the comments I checked. 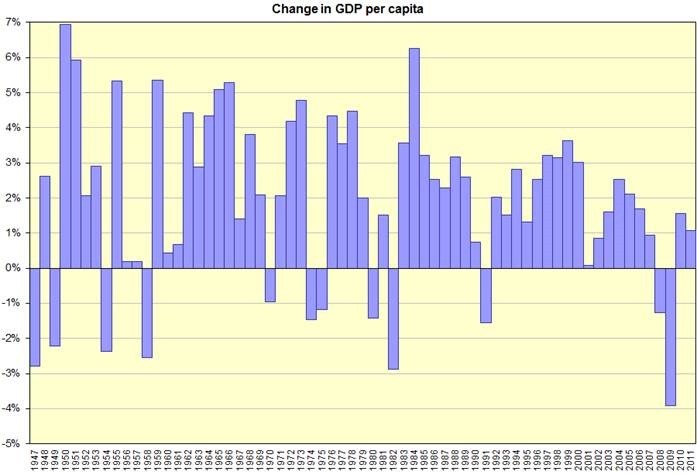 Ok, dumb mistake with the UK data: I left the GDP column blank. So the actual average since 2000 is 3.40%, rather high, and in recent years even higher. The UK figures are distorted by the moving of heavy industry out of the UK to the far east, the CO2 emissions are still made but just elsewhere, when you add the CO2 in imports back in then instead of falling they are in fact rising. So gesture politics are its worst. I live in BC and can assure you that the biggest effect of the BC carbon tax was to send the BC consumer, most of which live close to the USA border, to Washington state to buy gas. BC consumption went down and WA and total gas purchases went up due to the new trips to the US. As an added bonus the BC consumer also then bought more consumer goods in the USA as they were there anyhow further eroding the local BC economy. And this is held up as a success.